Size at Maturity: 30 - 50 ft NEW! 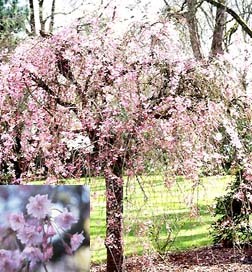 Weeping Yoshino Cherry - P. x yedoensis Shidare-yoshino this fast growing weeper would add a nice touch to the residential or commercial landscape where a large form can be used. It is very attractive where it can be used in a mixed planting bed of other deciduous trees and conifers where each others forms can be accented. Currently shipping 12-18'' Trees that are bare root. These are shipped in the Spring & Fall Only.